Olivia Cooke Photos, News, and Videos | Just Jared Jr.
Billie Lourd, Paris Jackson, and Alexandra Shipp show off their styles at the Christian Dior Couture S/S19 Cruise Collection photo call! The actresses teamed up for the event held on Friday (May 25) in Chantilly, France. Billie donned a semi-sheer black ensemble adorned with fun colorful details, completing her look with a partial updo and hoop earrings. Paris sported a muticolored strapless dress with an equally colorful bag strap and an assortment of jewelry, styling her hair into waves, and Alexandra looked sleek in a black leather dress with dazzling accessories. They were joined by Olivia Cooke, Florence Pugh, Arizona Muse, and Grace Van Patten. 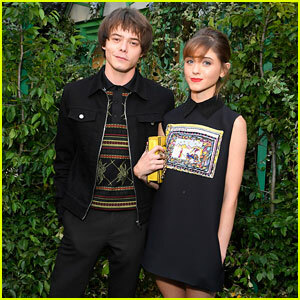 Olivia Cooke poses with co-star Tye Sheridan at the premiere of Ready Player One held at the Dolby Theatre in Hollywood on Monday night (March 26). The 24-year-old British actress and 21-year-old actor were joined at the event by co-stars Win Morisaki, Philip Zhao, Hannah John-Kamen, as well as director Steven Spielberg. Olivia and Tye both recently opened up about being incredibly nervous during their chemistry reads, all because Steven was there. Olivia Cooke looks out of this world amazing while stepping out for the European premiere of her movie Ready Player One on Monday (March 19) at Vue West End in London, England. The 24-year-old actress was joined at the event by co-stars Tye Sheridan, Win Morisaki, Philip Zhao, Hannah John-Kamen, Ben Mendelsohn, Simon Pegg, and Lena Waithe, as well as director Steven Spielberg. Ready Player One is set to hit theaters on March 29 and tickets are on sale now. The movie currently has an 81% on Rotten Tomatoes with 26 reviews so far. FYI: Tye is wearing Burberry. Olivia is wearing Prada. 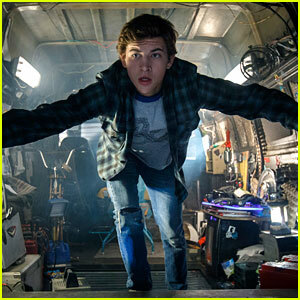 There are less than two weeks left until the movie Ready Player One hits theaters and this new of stills is making us so excited! Tye Sheridan and Olivia Cooke star in the upcoming film, based on the book of the same name by Ernest Cline. Here is the synopsis: The film is set in 2045, with the world on the brink of chaos and collapse. But the people have found salvation in the OASIS, an expansive virtual reality universe created by the brilliant and eccentric James Halliday (Mark Rylance). When Halliday dies, he leaves his immense fortune to the first person to find a digital Easter egg he has hidden somewhere in the OASIS, sparking a contest that grips the entire world. When an unlikely young hero named Wade Watts (Sheridan) decides to join the contest, he is hurled into a breakneck, reality-bending treasure hunt through a fantastical universe of mystery, discovery and danger. Make sure to see Ready Player One when it hits theaters on March 29! Ready Player One is one of the most highly anticipated movies of the year and the film’s stars Tye Sheridan and Olivia Cooke were on hand for the world premiere screening at the 2018 SXSW Film Festival! The young actors were joined by some co-stars for the event on Sunday night (March 11) at the Paramount Theatre in Austin, Tex. Also in attendance were Ben Mendelsohn, Lena Waithe, Win Morisaki, Philip Zhao, and director Steven Spielberg. Earlier in the day, the cast was interviewed by former The Talk host Aisha Tyler at the Ready One Player Live event, powered by Twitch and IMDb. There was a hiccup during the world premiere screening as the sound went out at one point and the film had to be restarted twice before it started working again! Ready Player One hits theaters on March 29!